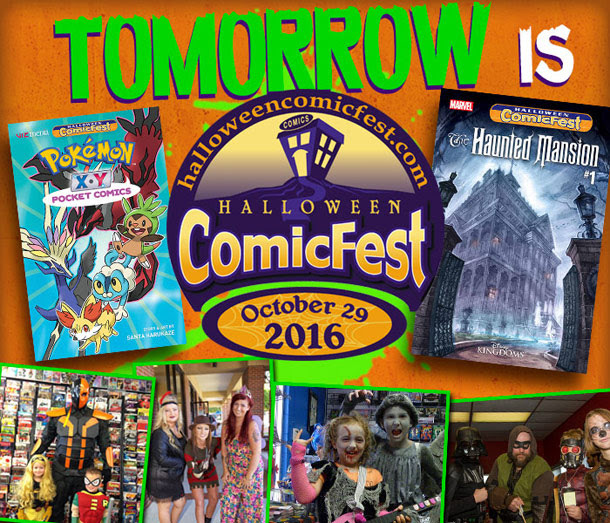 Halloween ComicFest 2016 happens on Saturday, October 29th! Use the store locator to find a comic shop near you! FREE Comics and Halloween fun for all! KJ Apa (Archie Andrews) and Camila Mendes (Veronica Lodge) take a break from filming The CW's Riverdale to share this video message! Retailers will also have HCF Mini-Comic Polypacks of 25 copies available for fans to purchase and pass out on Halloween to trick-or-treaters, party-goers, at school events and more. A great way to give out entertaining stories to kids, HCF Mini-Comics also provide an alternative to Halloween candy for trick-or-treaters! Designed to celebrate comic shops as unique community businesses and reach new customers, Halloween ComicFest helps retailers and the entire comics industry springboard into the end of the year holiday selling season. Comic fans are encouraged to check out www.halloweencomicfest.com over the coming months for more information on the event and local retailer activities. Also visit Halloween ComicFest on social media on Facebook www.facebook.com/halloweencomicfests, Pinterest www.pinterest.com/halloweencf, Twitter @halloweencomic and Instagram @halloweencomicfest.